Fiji, officially known as the Republic of Fiji is an island country in the South Pacific. Fiji is among the most developed islands in the Pacific. Tourism and travel contributes majorly to the economy. The most popular regions are the Coral Coast, Nadi, Denarau Island and Mamanuca Islands. Fiji is probably best known for its white sandy beaches and soft coral reefs. Fantastic diving spots also adds a touch of adventure to the beauty of these islands. Whether you are on a honeymoon, or need a family getaway spot, or simply want to enjoy a solo trip, Fiji will not disappoint you. Fiji consists of more than 300 islands spread across roughly 1.3 million square km of ocean. Because of this, its aviation industry is highly developed despite being a small nation. The country is home to 19 commercial airfields, plus seven private airports. Over the years, an increase in direct flights to key destinations in Fiji has played a major role in the increase of tourism to the country. Visitor arrivals have continued to increase over the past 20 years. In 1993, visitor arrivals stood at 318,874 which increased to 660,590 by 2012, an average increase of around 4.5 percent annually. In 2017, Fiji welcomed more than 840,000 visitors, and the numbers are continuing to increase. Fiji has over 50 hotels and resort spread across its two largest islands, as well as some of the smaller ones. In Fiji you will find many hotels that offer facilities of international standards. Alternatively, you can also choose to stay at the village to experience the real Fiji. Backpackers and adventurers are also well looked after, with a huge range of affordable hostels and island resorts that offer eco-tours. In order to keep up to international standards for tourists, Fiji resort furniture suppliers are in high demand. These suppliers have a huge responsibility of keeping themselves up-to-date with the latest trends in furniture designs. Most resort and hotel owners look for a custom hotel furniture supplier. These suppliers customise the furniture to suit your preferences, keeping in mind the aesthetics of the hotel. Fiji is blessed with a warm, tropical climate. During the period from March to November, the southeast trade winds bring dry weather. Fiji has rainy season from December to April. The tropical coastal climate brings along its fair share of surprises. In comparison to The Maldives, Fiji weather is quite similar, although the air is not as saline. Not all materials used for furniture can withstand these drastic weather changes and begin to fall apart quickly. Even the most durable of fabrics used for upholstery break down if not maintained properly. Vacuuming once a month and spot cleaning can go a long way in maintaining the fabrics. Patterned fabrics, tone on tone or textured fabric make the furniture look better for longer as compared to plain single colours. Currently, the usual Fiji furniture for resorts tend to be simple and functional. However, the trend is now moving towards more contemporary styles as tourists to Fiji become more design conscious. With the majority of Fiji’s tourists come from Australia, Fiji is quickly developing to be a leading beach holiday destination, rivalling the nearby island of Bali in Indonesia – a popular hotspot for Australian tourists. When selecting furniture for hotel rooms, it is important to understand that the Fiji climate is humid. Memory foam mattresses absorb heat and can begin to sag if used for longer periods of time. Hence spring mattresses or latex mattresses are a better choice. Also for mattresses covers, bed sheets, pillow cases it is wiser to choose breathable fabrics like cotton with light colours. Hotel furnishing trends concentrate more on common areas and lobbies, giving the guests an opportunity to leave their rooms more often and socialize. One point to keep in mind when choosing furniture for public areas is to ensure that the furniture pieces are developed with sturdy construction and strong joints for seating. These should also be built strong enough to accommodate guests of various weights or sizes. Fijian hotels also give importance to waiting areas. Considering the lunch rush hours or the dinner queues, having a large group of customers waiting inside for their meals is not a pleasant idea. Not only do they get in the servers’ way but also do not let the patrons currently having their meals enjoy them. Keeping in the mind the warm climate that the waiting customers will have to face outside, these hotels and resorts have pleasantly furnished waiting areas. These waiting rooms make sure that the customers do not wander away searching for food elsewhere. If you are looking for a quality custom resort furniture supplier, get in touch with our team here. New restaurants in Singapore are opening all the time. With the level of competition in the F&B industry in Singapore, it’s very important to ensure your guests have a memorable experience at your restaurant. For independent restaurants to be able to survive the test of time, it takes a unique competitive advantage. A successful restaurant in Singapore requires more than just a good location. Just a few of the obstacles that restaurant owners may face include fierce competition, hiring quality staff, knowledge & experience, and even random unexpected hurdles like the weather. So how do you create a memorable dining experience? A competitive advantage for your restaurant means establishing a quality that makes your restaurant the preferred choice in its market. This may be aspects of your food, drink, service, and even custom cafe furniture and ambience that give your venue superior value and help you stand out from the rest. There are many important elements that can provide a unique character for your restaurant in the marketplace. Among these are hospitality and service, price, menu selection, and much more. Themed restaurants are just one way to set the mood for a unique and memorable dining experience. This encompasses several elements of the restaurant, from menu, to service, decor, and ambience. Successful themed restaurants give restaurant owners a chance to establish a unique brand name that can help increase sales and keep customers coming back. 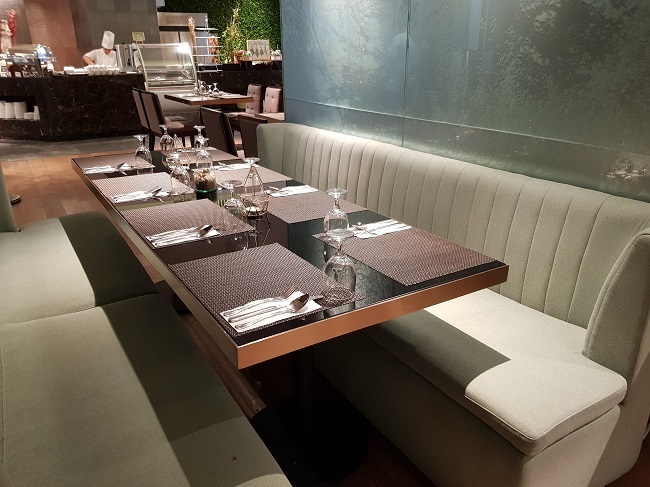 Onestop specialises in custom furniture in Singapore, including bespoke cafe furniture, as well as bar & restaurant furniture. We provides complete interior solutions for boutique and themed restaurants in Singapore. We work with you from start to finish to help you bring your ideas into reality. With more than a decade of industry experience as a bar & restaurant furniture supplier, Onestop has had the opportunity to work with a range of unique restaurants in Singapore and around the region. Here’s a quick look at some of the projects that we’ve worked on. Set in the iconic shopping district of Orchard Road, Prive Paragon provides a unique lifestyle concept as a relaxing alfresco restaurant, open from breakfast to dinner. For this project, Onestop took on the design and production for indoor booth seating, outdoor dining chairs, dining sofas, barstools, and dining tables. View the full project in our portfolio here. Serving up good vibes and fresh seafood, Bayswater Kitchen presents a casual sea-front dining experience with alfresco seating and dazzling waterfront views. Our job here included indoor and outdoor seating, including spindle dining chairs, dining tub chairs, and barstools. View full Bayswater Kitchen project here. A casual dining spot meets late night hangout: Overeasy combines a classic menu with stunning views for a fun & friendly experience. Touted as the ultimate American diner in Singapore, we worked together to create an authentic American diner experience with comfortable outdoor sofas, classic barstools and cafe furniture, and a cosy indoor seating area. See more photos at Overeasy here. An chic and stylish member’s club, Straits Clan pays homage to an era of exclusive events, intimate spaces, and fine wines and spirits. Aiming to build a modern community of ideas, innovation, and social change, we worked to create a space that is at once iconic and relaxing. This included a combination of lush sofas, comfortable lounge chairs, a casual dining area, and even massage chairs. This bar and restaurant in Shangri-La Singapore is a casual yet classy venue for an excellent dining experience. To provide an exclusive yet comfortable ambience, Onestop provided a custom selection of dining chairs, drink trolleys, and services stations which combine natural hues with uniquely crafted designs. Here at Onestop, we love thinking of new and unique ways to make your hotel and resort stand out from the rest. One of our favourite things is getting away from the more standard items, and focusing on resort furniture pieces that help set a mood or atmosphere for your property, and even create a memorable experience for your guests. The cabana with daybed is an attractive addition to your Presidential Suites or Premium category rooms. This resort furniture is made of solid wood, completed with outdoor cushions and outdoor fabrics, and is typically installed by private pools. These elegant furniture pieces are usually used in tropical climate resorts in areas such as the Philippines, Maldives, Fiji, and others. This outdoor gazebo is a fun and comfortable area for your guests to lounge about while enjoying the sea breeze. Combining durable materials and comfortable seating, the gazebo provides shelter, as well as an excellent place to relax during the day. This unique wooden accent table is made of solid wood and makes an excellent choice for displaying food or at a buffet. Suitable as a centerpiece or corner item, this wooden piece is both useful and beautiful to look at. If you’re looking for an unusual table design, this is one that is both rustic and contemporary. This relaxing weaved sofa is suitable for indoor or outdoor use. Combining the natural wood patterns with modern designed cushions, the sofa sets a fun yet calm mood for guests to sit, lounge, and relax. This exclusive piece is both a comfortable seat as well as a unique decorative item for your hotel, resort or café. With a sturdy base and seating area combined with striking colours, it’s the perfect addition to any room. Looking for more interesting ideas for custom furniture for your hotel or resort? Check out some of our other unique products here. Customised furniture in the Philippines is getting to be a growing trend. This includes hotel furniture in the Philippines, as well as furniture for restaurants, bars or cafes. There are many reasons why hotels might opt for custom contract furniture, rather than off-the-shelf or ready-made furniture. Some of the main benefits of choosing customised furniture include getting urgent projects done on time, finding a unique solution to your needs, or working together with a reliable team that can deliver according to your requirements. Choosing the right partner for fully customised furniture can be a daunting task. That’s why our custom furniture consultants focus on providing top quality service, to guide you through each step of the way. From the initial discussion till project completion, our team is ready to provide input in design, material selection, shipping and assembly. Onestop maintains a fully owned and managed furniture factory in Guandong, China. The factory employs over 200 craftspeople and highly-skilled artisans. Shipping your furniture from China is extremely cost effective due to free trade agreements between China and the Philippines. With 19% of all goods imported to the Philippines coming from China, and Philippines being part of the ASEAN Community, a number of taxes and duties are greatly diminished, and shipping costs can be close to zero. Usually, the shipper would only need to pay taxes and land charges for goods imported to the Philippines from China. Over the years, Onestop has provided custom furniture solutions for a range of leading hotels and resorts around the world. Some of our projects in the Philippines the prestigious I’M Hotel – the first 5-star hotel in the Poblacion district of Makati. At I’M Hotel, Onestop assisted in providing complete furnishings for the all-day-dining restaurant. Putting food as a central gathering point for the establishment, the restaurant provides delectable cuisine in a setting for guests to indulge and interact. We worked closely together with the hotel’s owners who wanted to design the furniture themselves. With guidance and consultation, we were able to produce a finished result exactly in line with the owner’s desires. Due to the hotel’s pre-opening dates, we had just a few weeks to confirm work and deliver for this custom contract furniture project. Despite the short time, we were able to successfully process this urgent request and deliver the items on time. If you have a hotel, resort, or restaurant in the Philippines, and are looking for a reliable partner for customised hotel furniture, get in touch! Drop us a message and one of our consultants will be in touch with you soon. Selecting furniture for your resort is an exciting process. There are so many styles and manufacturers to choose from, and each item you pick will shape the look and feel of your property. Deciding between ready-made and custom pieces may be the first step you take on this journey. There are several factors worth considering when choosing your resort furniture. Many luxury hotels and resorts are located in places known for their hot, sunny weather, like Hawaii, Bora Bora and the Maldives, and Seychelles. However, humid air, salty sea breezes and endless bright days can quickly destroy furniture that’s not made with the climate in mind. To avoid having to replace tables, chairs and other pieces every few months, ordering custom made resort furniture from a company familiar with your local environment is a smart move. Every piece of furniture should enhance a resort’s ambience . This is something pre-made items can’t always do. After all, a bed picked from a catalogue can’t match the appeal of an ornate four-poster model designed to fit perfectly under the high ceilings of a luxury suite. If your property has a specific theme or incorporates local culture into its look, you may find industrially-manufactured furniture doesn’t capture its spirit. For instance, a mass-produced chair probably won’t mesh with a tapa cloth from Fiji or an ornate Balinese carving. How about if you need to order something fast? This could be a replacement for a broken dining table, perhaps. Ordering a bespoke piece of furniture might not be a wise idea. Ready-made items are often available for immediate shipping and will arrive at your property in a few days or weeks. A custom order, however, may require much longer. The exact time would depend on the complexity of the piece and the availability of the craftspeople you hire. Pre-made furniture is often less expensive than something bespoke. Replacement parts for mass-produced items are usually easier to find and cheaper, too, so review your budget before placing an order. However, don’t forget that custom-made pieces are often stronger, making them better value over time. No matter what kind of furniture you invest in, always make quality your top priority. If you go the custom route, ensure you’re working with a professional outfit that produces pieces as durable as they are appealing. For ready-made items, ask if they have tested them to reflect typical use over time. Don’t forget to enquire about warranties, either. Knowing you’re covered if something goes wrong provides peace of mind money can’t buy.